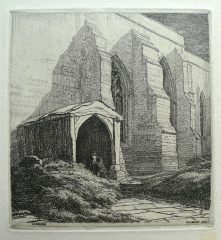 F.L Griggs was an etcher and illustrator. Born in Hertfordshire in 1876, he studied at the Slade School of Art and worked for two years 1896-8 in the architectural office of C.E. Mallows as an architectural draughtsman. 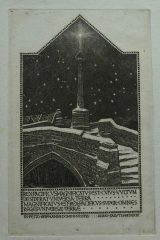 Griggs left architecture and began drawing and illustrating. 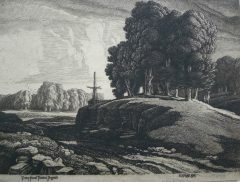 From 1900 he began working on pen and ink illustrations for the Highways and Byways series of English regional guides for the publishers Macmillan’s. In 1903 Griggs arrived in the Cotswolds to work on the local volume of the series, and decided to settle in the village of Chipping Campden, where a community of Guild of Handicrafts had already been established by C.R. Ashbee. He became closely associated with Ernest Gimson, whose interest in the traditional methods and materials of building he shared, and began working in partnership with him from 1917 to 1919. In 1927-37, Frederick Landseer Maur Griggs began to design a new house for him and his family which he called the ‘New Dover’s House’. It was designed in the Cotswold Arts and Craft style. 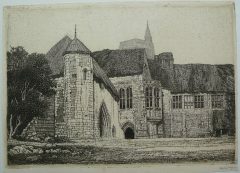 It was here where he eventually printed late proofs of the etchings of Samuel Palmer, as well as his own work. 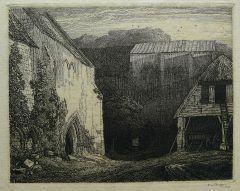 In 1912 F.L.Griggs began etching, becoming a leader in the British etching revival, “the most important etcher who followed in the Palmer tradition” (K.M. 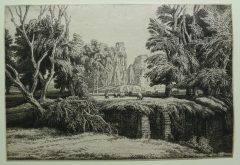 Guichard, British Etchers, 1977). 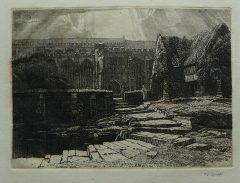 He produced fifty-seven etched works prints in all, depicting idealized Gothic buildings and landscapes. 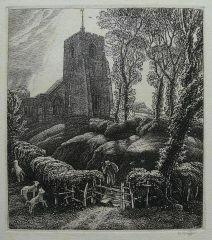 Griggs was influential in the reappraisal of the etchings of Samuel Palmer. 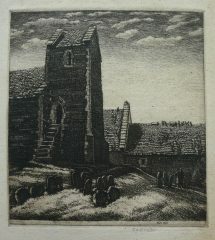 This, and his style of etching, influenced the younger generation of neo-Romantic artists, including the early Graham Sutherland, and the group of printmakers which includes Paul Drury, Joseph Webb, Robin Tanner and John Piper. F.L.Griggs died suddenly in 1938. His widow Nina moved to Barnes, London where she died in 1988.